Stand Up Paddle boarding (SUP) is a fun and relaxed introduction into water, paddle and surf sports. It is also a great workout, while exploring stunning scenery and wildlife from the water. You will leave with a different, new experience and perspective and a sense of achievement and adventure. 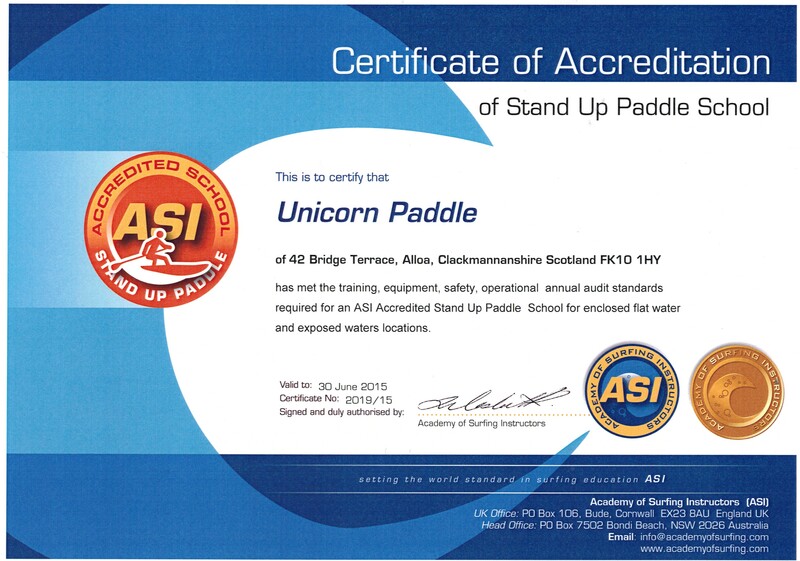 Unicorn Paddle is an ASI qualified, accredited and SUP insured. Stand Up Paddle School for structured, quality and safe Lessons and Tours along inland and coastal waters. We would like to welcome you “on board” . Please get in touch, if you do have any questions and we will be happy to help. Lochs: Loch Lomond island hopping (incl. the “wallaby island), Loch Katrine, Tay, Earn, Lubnaig, Venachar, Arklet, Voil, Loch Leven (2 islands), Gartmorn dam and many more Highland and Westcoast lochs (on our overnight weekend activity trips). Rivers: Various upstream sections of the River Forth and Teith: Wildlife, islands, Stirling bridges and downstream windings, some tide dependent. River Tay, Spey and other rivers. Beaches: Coastal waters East, West and up North, and short distance island hopping (e.g. Firth of Forth and Clyde Islands, etc.) when conditions are favourable. Canals: Union canal (Avon viaduct and tunnel), Falkirk wheel area, Forth Clyde canal,. Caledonian, Crinan and other canals. All equipment: Stand Up Paddle board, paddle, leash, wetsuit, wetboots, gloves, hoods, triple dry bags and rucksack. Wear light clothes (you have to carry them in the triple dry bag). Bring a snack, drink and a large towel. Remember sun screen and a camera if you want to. You get the most enjoyable experience in light winds. ASI rules are that we can only operate in winds of less than 12mph and we find that beginners find it hard to paddle against winds of more than 10mph with occasional gusts and larger swells. We do however try to find alternative more wind-sheltered locations, one example being Loch Tay which is surrounded by higher mountains on all sides. Our pride and joy getting us out and about to spectacular loch, river, canal and coastal SUP locations all across Scotland. We pick up from Alloa railway station (1 station on from Stirling), Stirling University and any easy, obvious quick to get to place that is on route to our paddle location, for example Balloch railway station if you are coming from Glasgow and joining us for our Loch Lomond paddle trips. It is an 8 seater van with plenty of space for our SUP equipment and wetsuits and it is in fact high enough to actually stand up in it – our perfect Stand Up Paddle van – it is also ideal to get changed in it should it be cold, wet, windy or midges outside! Unicorn Paddle is owned and operated by Mike Hergert, originally from Germany. Mike has been travelling extensively around the world and since 1996 has made Scotland his home and has been organising travel and tour guiding people from all over the world at Unicorn Travel @ Stirling University. Mike loves all water sports, walking, cycling, nature and wildlife and the freedom that travel and being outdoors and in the wilderness brings. Mike holds ASI Level 1 Stand Up Paddle (Enclosed Flat Water) accreditation and ASI (academy of surf instructors) Level 2 Stand Up Paddle (Exposed Waters) accreditation, first aid, water rescue safety, VHF radio, navigation and other qualifications. He loves to inspire you to take up Stand Up Paddle boarding and to experience the sense of freedom, happiness and the joy and fun SUP brings including seeing the beautiful Scottish countryside and wildlife and getting the prime and best perspective from the water. Being in and on the water is pure bliss and fun. Mike would like you to switch off and relax for a day to have great fun, a sense of achievement and an amazing first hands nature experience that you won’t forget..